Search this article. Use 'Enter' to find next. Use 'Home' to search again. A Golden Dream in Timekeepers. By: Pier van Leeuwen, 2003.
curator of the Museum of the Dutch clock. French pendulum clocks seem to be causing much interest this year, especially when one thinks of the exhibitions ‘Empire Mantel Clocks’ in Zaandam and ‘Royal Clocks’ in Schoonhoven as well as the publication by Dr. J.J.L. Haspels ‘Royal clocks: Clocks in the Palace of Het Loo’. During the reigns of Louis XV and XVI and after Christiaan Huygens had established his name in the Versailles of the sun king, Louis XIV, and watchmakers, such as Isaac Thuret and Nicolas Hanet, had popularized their pendulum clocks in France, a great diversity of mantel clocks, often with flamboyantly decorated cases, developed from the ‘pendule religieuse’ – the baroque alternative to the ‘Hague clock’. Towards the end of the 18th century, round clock movements became a reliable mass-produced product encased in striking examples of applied art. Despite the fact that Napoleon Bonaparte disbanded the guilds, metalwork reached its peek around that period. The fine modeling, gilt and patina finishes used in these series-produced pendulum clocks are matchless. Clock movements seemed to become an excuse for a propaganda masquerade. For years critical culture philosophers had banished these objects to the misled kitsch corner, nowadays, however, they can be regarded as collectors’ items. The excavations of Herculaneum (1738) and Pompei (1748) and the publications by J.J. Winckelmann and Piranesi produced a revival of interest in classic antiquity. Neo-classicism formed a vehicle for enlightened ideas on humanity, social sciences and esthetics. This was the backdrop to the French Revolution. With the fall of the Ancien Régime, republican leaning and architectonic designs developed and these were based on strict, platonic ethics. The emergence of a man who saw himself as successor to Augustus (the founder of the Roman Empire) and who crystallized from an ambitious sergeant into a megalomaniac despot greatly influenced the first quarter of the 19th century. During his Italian and Egyptian campaigns under the Directoire-government, Napolean Bonaparte followed the Roman blueprint in his imperialistic bids for power and used it as his house-style during his reign. Just as Augustus chose Greek art and culture as his model, Napoleon chose the Roman empire. Classic bounty was to support the aspirant dictator’s bid for power. Antique treasures such as the Hellenistic marble Laokoon group, the ‘Apollo Belvedere’ and the river gods, Tiber and Nile, from the Vatican as well as the bronze ‘Brutus’ bust and the ‘Spinario’ (thorn-extractor) from the Capitol, made their entry into Paris in triumphant processions. The bronze horses from the San Marco in Venice were to crown the neo-classic Arc de Caroussel (based on the Roman triumph arch built by Septimus Severus) which was being built by the architects Percier and Fontaine opposite the Louvre. The Napoleonic Museum was opened in a wing of the Louvre and exhibited many of these statues as well as most of the Borghese collection including those of the warriors ‘Ares Borghese’ and ‘Borghese Gladiator’. This collection still forms the basis of the Louvre’s classic sculpture collection. The Roman column of Trajanus, was used as a model for the Parisian Colonne Vendome, which, according to hearsay, was made from melted down canons captured off the enemy. Even applied art bore the characteristics of war and both furnishings and furniture showed traits of Napoleonic propaganda. Whole rooms were furnished as complete battle tents with lamps in the shape of arrow canisters, small tabourets in the shape of drums and mantel clocks in the shape of war trophies. On the eve of the Empire (1804 – 1814), the style Directoire showed an inclination towards designs embracing idealized Indians and Africans, best illustrated by Rousseau’s concept of the ‘Nobel Savage’. In addition, the corporeal ‘Description de l’Egypte’, a product of the Egyptian campaigns, ignited an obsession for all things Egyptian with obelisks and sphinxes being the focal eye-catchers. One of the obelisks brought to Rome by Augustus acted as a giant sundial dedicated to the sun god Sol/Apollo, the emperor’s personal guardian god. The column was erected opposite the Ara Pacis alter, erected to mark Roman peace. In the 19th century another Egyptian obelisk was shipped to Paris. The opening and excavation of Roman ruins in Rome and Pompei led to the definition of the style Empire. Imitation Pompeian tripods were used as stands for washbasins. ‘Recamiers’, after the famous portrait of Madame de Recamier by J-L. David, became popular recliners. The most popular decorative motif, the twisting acanthus climber, was copied directly from embossments round the Ara Pacis, meant to symbolize the fertility of Roman Peace. The swan, Augustus’s symbol for Sol/Apollo, became Empress Josephine’s favorite motif. Napoleon chose the coat of arms of the Imperium Romanum as emblem for his new empire; a winged thunderbolt with crossed streaks of lightning, characteristics of the roman god Jupiter. The exhibition ‘Empire Mantel Clocks; a Golden Dream in Timekeepers’ consists of a representative collection of privately owned mantel clocks (so-called ‘pendules à sujet’), complimented by two examples of clocks owned by Louis Napoleon, king of Holland and brother to the Emperor, both on loan from museums. The clocks were selected and are exhibited according to their illustrative and decorative motifs. The theme ‘The Heroes’ illustrates the phase at which power is to be seized. A beautiful obelisk mantel clock (ill.1) shows allusions to the Egyptian campaign as well as to the Augustan obelisk on the Piazza del Populo, constructed under pope Pius VII. It is decorated with very fine applications depicting a war trophy, swans and acanthus climbers. The most eye-catching example is that of the well-known empire clock depicting J-L David’s painting, The Oath of the Horatii, which is based on Livius’s history of Rome. Louis Napoleon kept this clock, which illustrates patriotic fearlessness, in his salon in the Palace on the Dam Square. Similar examples can be found in the royal collections of Britain, Sweden and Bavaria. End of this section, click here to continue. The ‘Muses’ theme includes no less than eight mantel clocks depicting the arts and sciences. Central in this theme is the empire clock, ‘The Library’ by brazier Antoine-André Ravrio and clockmaker Mesnil. This clock, said to have been a present from Louis Napoleon to his minister, is on loan from the Municipal Museum de Lakenhal. It is surrounded by various clocks with figures of readers, students and musicians (ill. 2), such as an ‘Astronomical’ example and a ‘Music lesson’ one. As far as design and titles were concerned, the classics were often used as a reference. It is no coincidence that a pillar with Homer’s bust adorns many a bookcase. Surrounded by these classical travesties, the modern-day pendulum clock appears as an anachronously inappropriate duck out of water. Similarly, historical preference did not depict scrolls but the more modern bound volumes. Incidentally, the most famous writers of Napoleonic times, Chateaubriand and Stendhal, often criticized the Napoleonic government. Of the composers, Beethoven springs to mind. He intended to dedicate his third symphony (‘Eroica’) to Bonaparte but disapproved of the despotic emperor. The classical gods served as models for a new Golden Era by replacing the Christian ones. 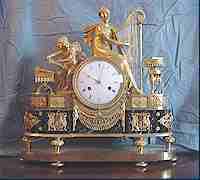 The chariot clocks or ‘pendules au char’ were an exceptional category of Empire clocks. Apollo, Diana and Amor, depicted as triumphant chariot drivers, were the most popular gods used. One example is the group of Olympian gods on the Parthernon pediment in Athens which portrays the sun god Helios/Phoebe (Phoebos) Apollo and the moon god Selene/Artemis. In classic antiquity the orbit of the planets was seen as a chariot race of the gods. In Homer’s Ilias the gods are portrayed in war chariots. Strangely, Mars, the god of war, was less popular in Napoleonic clock-making. It seems that Diana more or less replaced him as a vengeful double nature of the moon and hunting. Apart from a triumphant Diana portrayed in a chariot pulled by hunting dogs, the exhibition also displays a scene taken from Ovid’s ‘Metamorphoses’ (ill. 3). Here we see a daydreaming Actaeon who, having seen the chaste Diana bathing is destined to be savaged by his dogs. A third clock is an ode to the Empire’s prosperity. Here we see Ceres, goddess of agriculture, who was often an example for Augustus’s wife, Livia. More romantic subjects also gained popularity in the shadow of the struggle for power and knowledge. During the Restauration (1815 – 1830) this popularity led to clocks bearing trivial and exotic subjects. The three exhibits in this section show a mother playing with a child and a shepherdess in pastoral surroundings called ‘The Tempel of Love’ (ill. 4). This scene would not have been out of place on the Palatine Hill or in Pompei. In the last exhibit, again a product of Ravrio and Mesnil, Amor, god of love, attempts to drive back Aurora, the dawn goddess. In our country the Empire was to make way for King William I. The unfortunate Louis Napoleon had already been recalled by his brother, leaving his possessions behind. The Empire style was adopted by heads of state who had once been Napoleon’s fiercest opponents. Even today these classic designs are much appreciated from the White House to the Kremlin. One can be astounded, amazed or amused by these reminders of the golden dream. The exhibition was held at the Museum of the Dutch Clock in 2003.